Supplied with the Chauvin MN93A current sensor (120 A). 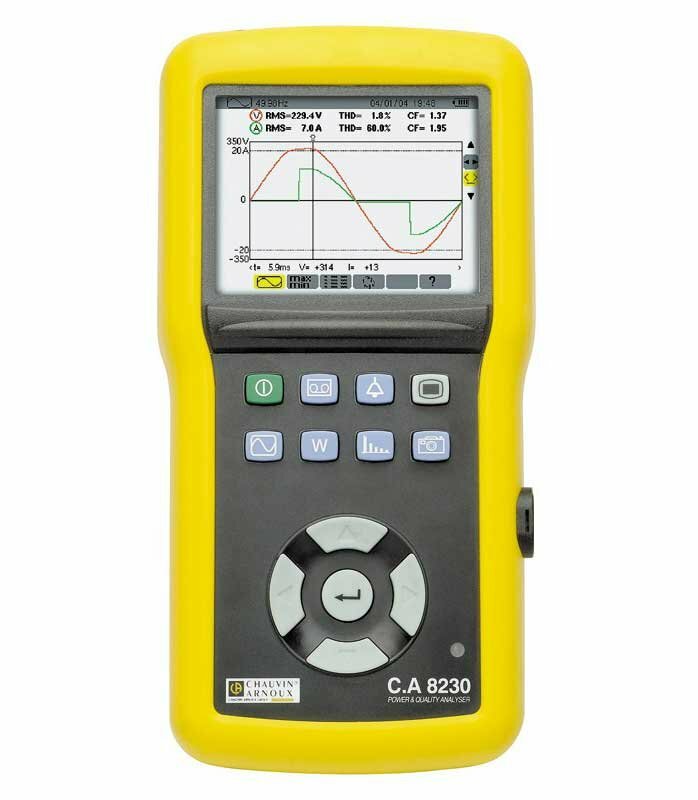 The Chauvin CA8230 single-phase or balanced three-phase power analyser is economical and extremely easy to use. Equipped with direct access to its various functions, it provides greater safety as it automatically recognises the type of connected sensor. It is ideal for on-site or bench-top use. It provides you with all the power measurements you need. 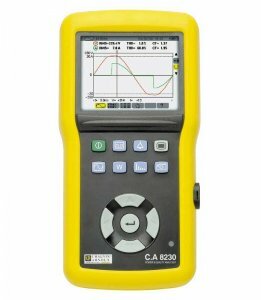 It will enable you to measure and qualify your electrical network harmonics. An Inrush mode for starter currents will show your waveform in detail during several seconds. Voltage range: from 6 VRMS to 600 VRMS AC + DC. AC current range: from 5mA to 6500A. DC current range: from 1 A to 1700A. Screen: Colour 1/4 VGA LCD. Fundamental frequency: from 40 Hz to 70 Hz. Single-phase and three-phase balanced: Yes. W, VA, var powers, DF, THD, Cos: Yes. varh and VAh energy: Yes. Recordings: up to several days. Stores up to 8 screen captures. Phase rotation: Yes, with display of phase order in three-phase. Power Batteries: autonomy up to 40 hours. Compliance: IEC 61010 CAT III 600V. Dimensions: 211 x 108 x 60mm. Chauvin C.A6230 Warranty: 1 year. C.A 8230 instrument supplied with 1 carrying bag, 6 fitted 1.2 V rechargeable batteries, 1 red banana lead (straight-straight), 1 black banana lead (straight-straight), 2 x 4mm test probes (1 red, 1 black), 2 crocodile clips (1 red, 1 black), 1 mains adapter, 1 optical USB cable and Power Analyser Transfer software.